A stunning matched pair of the rare dolls from the 1954 FASHIONS OF A CENTURY series. 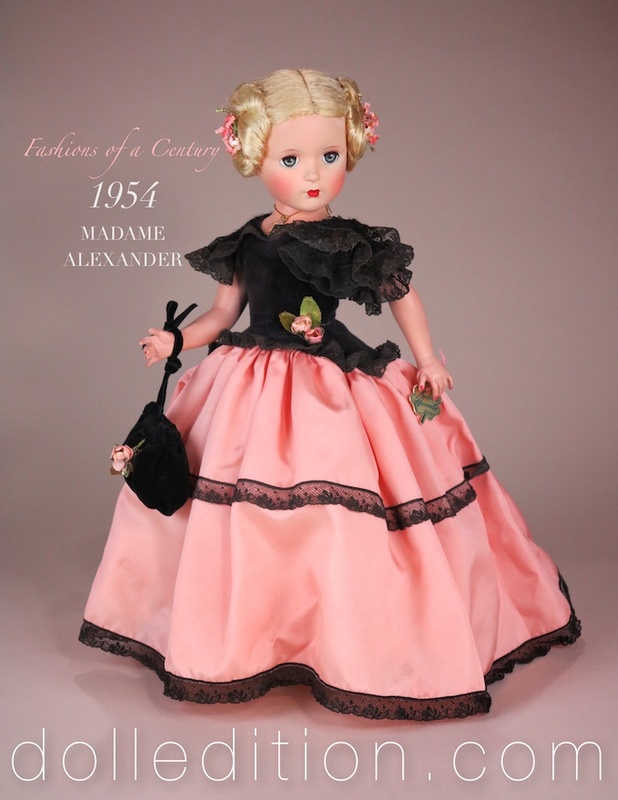 The dolls of Madame Alexander are extensive and diverse. Sometimes decades overlap in what is loved, cherished and desired. Occasionally it’s a dramatic and complete transition into something new. Dolls have always reflected the world they are created. Technology changes, culture evolves, trends come and go. Every so often, as with the Baby Boomers, an entire generation moves on and grows out of dolls and toys and into young adults. This golden age was a unique collaboration of events that fell into place to make this creativity possible and with an audience that could support this elaborate collaboration of the creative choices of the company with the factory. The unions play an important part on how production unfolds. Retailers were the backbone of it all, with their stores, their distribution and their patrons. These flat-footed dolls were part of an unusual chain of events that needed each part of this chain. The result was the ability to produce some of the finest dolls of the Madame Alexander Doll Company. Some collectors refer to this as the “flat footed” dolls of the late 1940s and into the early 1960s. FASHIONS OF A CENTURY - 18 inch Lady, part of a nine doll series from 1954. These are among the rarest of Madame Alexander dolls. In Godey styled costuming, dressed in peach taffeta, black lace and velvet, the doll has a mesmerizing presence. One of her features is her elaborate coiled hairstyle. 1951 was the first year to receive the Fashion Academy Gold Metal, followed by 1952, 1953 and 1954 - this pair of FASHIONS OF A CENTURY dolls still has their Fashion Academy hang tags.